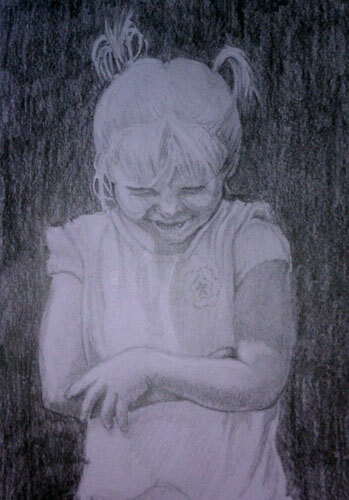 This is a little sketch I did today of my granddaughter, Lilly. The reference photo was from a year or so ago. She is so photogenic and always ready to pose for the camera that I have a nice collection of pictures of her to draw from. I have been enjoying the simplicity of my sketchbook lately and the freedom that graphite brings. I can mold the lights and shadows almost like developing a sculpture. I enjoy using different value pencils, the softest being the darkest. I stopped on this sketch before it became too much of a completed drawing. I just wanted to study the simple lights and shadows that bounced around her face, body, and clothing.